When I hear Shepherd’s Pie I think to myself, I don’t want some shepherd making my pie, I want the shepherd out in the field, making sure nobody steals my sheep; I want grandma making the pies. So no, I didn’t order the traditional Irish dish and instead opted for the Kerryman salmon sandwich. I got a lot of heat for this decision. My buddy ordered the Shepherd’s Pie, three shots of Jameson (you can see two glasses in the background), and two Guinness pints. Now don’t you think that’s a little excessive? Don’t you think an Irish person would be offended by such blatant pandering to their culture? As an American, if I were sitting in McDonalds over in Dublin and some Irish fellow ordered up two Big Macs, a super-sized fry, two Cokes, and and a chocolate shake, I would be insulted. Only a few people in America really do that. That’s a caricature of the excessive American fast-food diet that’s really only accurate for about 75% of this country. Many Americans, of course, would get the Diet Coke. So yes, I got the salmon sandwich. 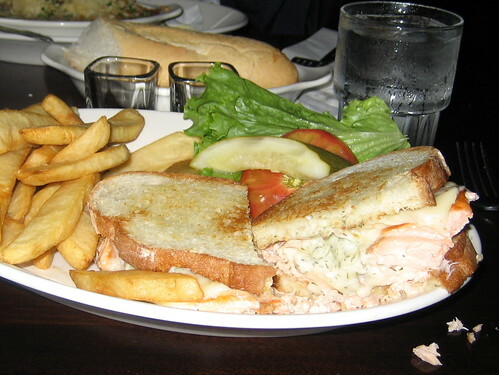 I did so because it was actually called The Kerryman Salmon Sandwich, so I figured it had some Irish roots. It was a huge, grilled salmon filet with cheese and a dill cream sauce, on toasted bread. Wow, was it good. I haven’t had a thick and meaty non-fried fish sandwich like this since my grouper sandwich in Florida. The bread it was served on was a toasted Italian-style white bread (but a little more dense), which was perfect because it fit the elongated nature of of the salmon like a glove. Also note the thickness of the salmon filet, which converts to about a one-to-one protein-to-bread ratio. That’s right in my wheelhouse baby, you know that. Finally, check out the flecks of dill in the sauce. I’m not a heavy user of dill-specific sauces and I don’t know much about them. I was just glad not to have a standard tartar sauce served with it. The Kerryman was busy on a Thursday night. It’s at 661 N. Clark Street so it’s close enough for a little bit of a downtown crowd, but also attracts some of the Rush Street set. The outdoor patio was packed, but finding a seat upstairs was not a problem. My buddy loved the Shepherd’s Pie and the fries were good. Just another fine, Irish Pub-style experience in Chicago. Posted in food on 2007/09/07 by John.